Shot by elephant poachers, the manager of Congo’s Garamba National Park asked a ranger for help to bind his leg with a tourniquet to slow blood loss. “While we were doing this, I could hear another person get hit on our right, and then within a few seconds, also hear another person get hit on my left,” Erik Mararv said in an interview with The Associated Press in Johannesburg, where he received medical treatment. Three rangers – half of a unit that deployed to the scene of an elephant killing – were killed in the April 23 shootout in Garamba, where armed groups poach elephants for ivory in one of Africa’s most volatile areas. It was not an isolated incident. A total of 11 Garamba rangers and Congolese soldiers have been killed during anti-poaching missions in the past year, highlighting how conservationists in some parts of the continent become combatants and, on occasion, casualties. The poachers who attacked the rangers in Garamba, a UNESCO world heritage site, last month are believed to have come from South Sudan, just across the border. Other groups that have operated in Garamba include ivory hunters and militias from Sudan, and the Lord’s Resistance Army, a Ugandan rebel group led by Joseph Kony, who is accused of war crimes. The park has also reported incidents in which poachers killed elephants from helicopters. African Parks, the Johannesburg-based group that manages Garamba and nine other wildlife parks in Africa, wants to increase the number of Garamba rangers from 100 to 250; additionally, some 50 to 100 Congolese soldiers are already deployed to guard the park. African Parks is also considering the acquisition of a “bigger air carrier” more suited to military-style operations than a helicopter that carries fewer people, and wants to increase cooperation with U.N. and American forces operating against armed groups in the area, Mararv said. Violence also erupts in some other African parks. Zimbabwean rangers confronted 10 suspected elephant poachers from Zambia who had crossed into Zimbabwe’s Zambezi National Park at night, and two poachers were killed, Bhejane Trust, a conservation group, said on Facebook last weekend. 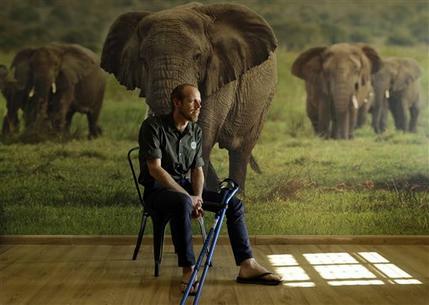 In January, elephant poachers in Tanzania fired on a helicopter on an anti-poaching mission, killing the British pilot. In March, rebels in Congo’s Virunga National Park killed two rangers, according to park director Emmanuel de Merode. De Merode, who was seriously injured by gunmen in 2014, has been in touch with Mararv, a friend, since the Swede was shot. De Merode has been “very encouraging,” Mararv said. Garamba rangers inspecting the area after the April fight found the backpack of a ranger killed last year and the South Sudanese poachers are believed to have also suffered casualties, Mararv said. The group had killed an elephant but didn’t have time to remove its tusks.